Have you seen a shadow person? Read about one of the world's current phenomenons in my updated blog that is happening more and more frequently and being reported to the paranormal community. What is a shadow person? By definition a shadow person, also known as a shadow figure, shadow being or black mass, is an alleged paranormal entity. Their movement is often described as being very quick and disjointed; they may first move slowly, and then rapidly "hop" to another part of a surrounding. Some witnesses describe this movement as though the shadow entities they have seen "danced" from one wall to the next. They often completely disappear into solid walls. A number of religions, legends, and belief systems describe shadowy spiritual beings or supernatural entities such as shades of the underworld, and various shadowy creatures have long been a staple of folklore and ghost stories. The phenomenon can take many forms: big, hairy, shadowy spiders, cats, clouds, black masses, or where a head is directly connected to a set of broad shoulders and, at times, you can see red glowing eyes. 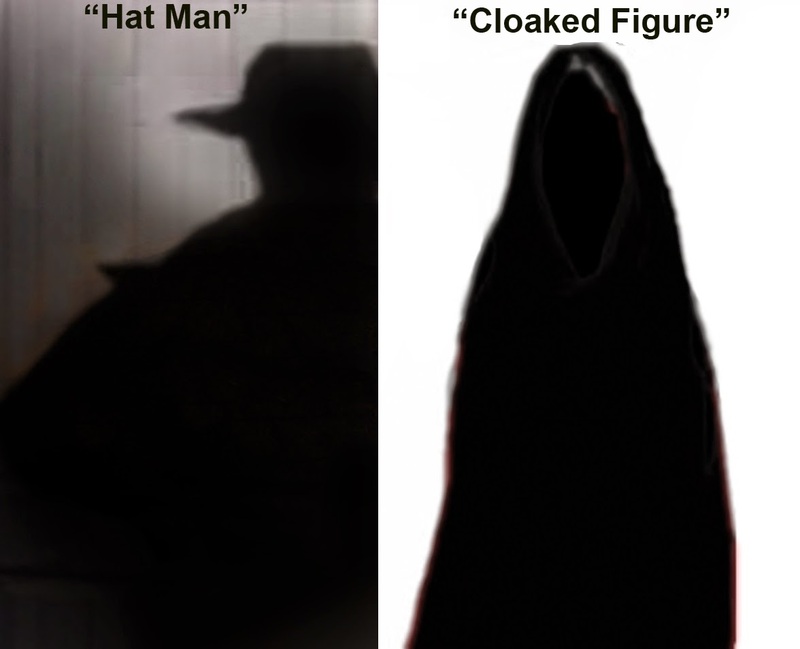 Shadow people are described with striking similarities all over the world such as the Hat-Man which is described the same from small children to adults. The common traits are dark silhouettes with human shapes (usually a masculine shape) and profiles. Some shadow people are wearing coats and hats and a few have claimed to see them with bright red glowing eyes. Others talk about the "Hat Man," a solid creature as having "a Zorro-type hat" or "a Fedora type hat". He wears a three piece suit and a cape or a long trench coat, and possesses glowing red or solid black eyes. Even more terrifying is the entity covered in a Hooded Black Cloak with no feet! There is scientific research that tells of several physiological and psychological conditions can account for reported experiences of shadow people. A possibility could be it's an illusion from sleep deprivation, which may lead to hallucinations. Another theory is that Shadow people are psychological in nature, and that they are somehow linked to a modern stressful lifestyle. One scientific explanation is that shadow people are seen mainly in the corner of ones eye from a condition known as Pareidolia, that could be responsible. This is a condition where vision in the peripheral area of the eye incorrectly interprets random patterns of light/shadow or texture as being familiar patterns such as faces and human forms. Can shadow people be spirits of once living human beings that are stuck here on earth and maybe for one reason or another can't move on? A lot of people who have seen and experienced shadow people don't think that shadow people are residual haunting's. Most people who have seen shadow people think that they are intelligent and able to come and go when they want. Some people even say they think shadow people may be another life form entirely or may be the extra-dimensional inhabitants of another universe. Online discussion forums devoted to paranormal and supernatural topics describe Shadow People as menacing, among other believers and paranormal authors, there is no consensus that shadow people are either evil, helpful, or neutral. 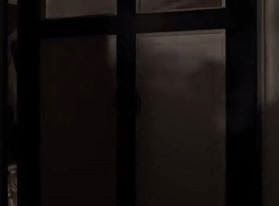 One of the more frightening forms witnesses recall is the black mass, an appalling dark form with a vaguely humanoid stance, which the witnesses unanimously feel represents pure evil can jump on your chest to choke you. The "Hat Man," is claimed to be a form of evil incarnate and speculated that the being is the Devil himself! August 2009: our cousins visited the house of my deceased friend hoping to capture some paranormal activity on their cameras. The chapter describing what took place during that visit is in my published book, Estate of Horror. www.estateofhorror.com. 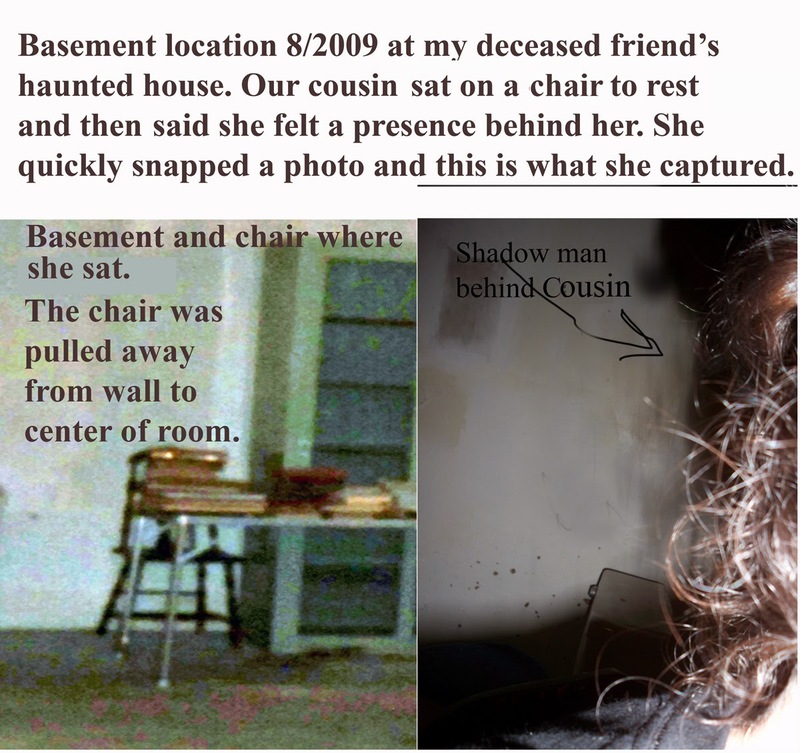 Our cousin *"Karen" sat on a chair during the time spent documenting the activity in the basement of the house that harrowing day and soon felt a presence behind her. Following photo shows what she captured on film. 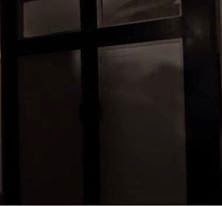 Her sister also recorded a darting dark figure behind a wardrobe closet. On June 2010: My son, Chris awoke suddenly in his bedroom and saw a dark figure near his chair. He instinctively snapped a picture with his cell phone camera and went back to sleep as it was very early. When he woke up several hours later he thought he had dreamed the event. That was until he looked at the image he captured on the camera. A dark hooded creature that seems to float off the floor. He showed it to me as he was getting dressed and I suggested he take another photo of the chair to compare before and after. That is why there is a slight change of the shirts moved in the other frame but the photos were taken the same morning. My family have seen small shadows darting along the baseboards and ceilings in our home and these have been connected with poltergeist activity at the same time. Our producer and crew said no one heard any dog barking or noise (this was midnight and no one was around but us)when they were filming and our cinematographer and director and crew were not wearing hats. So, Should You Be Afraid? It depends. Has it caused you to be frightened by its presence or has shown aggression towards you? That can be a problem. If you've never been harmed it may just be part of the home's original history (like with our experience) and is just an echo of a spirit or ghost that has existed for an extended period of time. It could be a being created through negative psychic energy or a lost soul who has been wronged, has unfinished business or has evil intent. Perhaps just an hallucination or optical illusion brought on by the psychological circumstances of stress, or mental illness. These are things you have to keep in mind to understand its reason for being there or just exactly why they are suddenly there at all. As the old 1940's radio detective show "The Shadow" used to say in its opening line, "Only the Shadow Knows!" I feel somewhat validated that other people have seen the same shadow man that I have, fedora hat and long trench coat, all in black. I can certainly rule out hallucinations or any mental or unstable conditions brought on by stress or personality dysfunctions, because ... my adult daughter saw the same exact shadow man at the same time I did. If there is a witness to what you saw, you just know there is no denying it. We did not see this shadow man out of the corner of our eye either, we were both looking straight ahead, we had a straight, full on view. This figure stood upright ... but there were no feet. My daughter and I tried to re-create the shadow figure, it was determined that the shadow figure could only be replicated by standing "in" the house. We were home alone that evening ... so we thought. Thank you Robin for commenting on the blog. Shadow people can be spirits of once living human beings that are stuck here on earth or some residual haunting of their home from another time. People who have seen shadow people think that they are intelligent and able to come and go when they want. They may be another life form entirely or may be the extra-dimensional inhabitants of another universe. 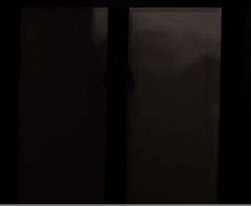 It is hard to say in your case but we found OUR shadow man to be someone who lived on our property many years ago and went to prison for murdering his wife. I found this researching the long history of our property dating back to the early 1700's. (we live outside Philadelphia, PA) You may be able to research your home's history for a dark past or if you feel threatened I would contact a minister or priest to preform a blessing or cleansing of your house. It's worth a try. God bless. I have seen the hat man. I thought I was the only one. Strangely enough, I have also seen a woman. Her hair was up in a tight bun on her head and she had no face. My mother saw her too. I've had shadows guard the door of my room, standing in front of me, as to block my way out. Not sure if they're evil. But I don't think they're necessarily good.